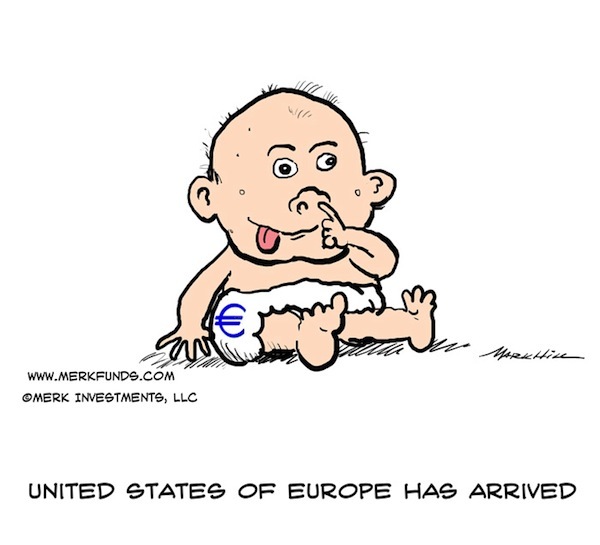 Merk Insights - United States of Europe has Arrived! United States of Europe has Arrived! A vision "Towards a Genuine Economic and Monetary Union" has just been published by the European Union. Key components include integrated financial and budgetary frameworks. The goal is to achieve a “strong and stable architecture in the financial, fiscal, economic and political domains.” For a vision to work, it has to be realistic. The budgetary framework calls for “joint decision-making … and … steps towards common debt issuance.” Given that German Chancellor Merkel was quoted as saying Europe will not have shared liability for debt as long as she lives, such goals seem a tad ambitious. Understanding that Merkel is like a mother to the United States of Europe, she should consider nurturing it with vitamins, love and care. Intensive care is what peripheral Eurozone countries are in. Let’s focus on the good news in terms of European integration: those countries that require assistance have yielded sovereign control to the European Commission. Presto! That’s the key element of the union. Those that have proven prudent in managing their budgets don’t need to yield control to Brussels bureaucrats. But those that are not capable do. It may sound like an unbalanced union, where not everyone is ceding control, but given the political realities, policy makers ought to leverage the cards they are dealt. Regarding the so-called banking union, the same principle applies: countries that have been incapable of cleaning up their own banking system, ought to cede control. Seizing control from national bank regulators, including a European resolution scheme are key; but unlike the proposed vision published by the European Union, such a scheme must start with the more modest goal of first intervening where calls for help have been issued. The way you leverage on the framework is by providing hope and support to those that succumb to it. Some vitamins, when administered in too high a dose, may be toxic. The European Stability Mechanism, the ESM, has shown such toxic characteristics. Because the ESM subordinates all other debt, it has made such subordinate debt toxic. The ESM is a last resort bailout scheme, not a tool to promote a “strong and stable architecture.” The discussion about the solution must include Eurobonds. Having said that, vitamins do little good if not accompanied by underlying lifestyle changes. Put another way, as long as policy makers look for evermore creative ways to finance rather than to reduce debt, the underlying disease won’t be cured. Ultimately, debt will need to be reduced. The way it looks, it may be more likely be through default than sustainable fiscal policies. The price for living beyond one’s means and failing to regulate one’s banking system should be the loss of sovereign control over budgeting and regulation. This part is already reality, as evidenced by the various bailout schemes in place. What is not in place is a mechanism to allow those chronically sick children to get back on the right path, for national governments to conduct policy with enough dignity, so that political backlash won’t tear those countries apart. Countries that want final control over where bailout money is spent, need to accept the seniority status of IMF and ESM money. Eurobonds (without seniority over outstanding bonds) should be issued to finance projects that are directly supervised by the European Commission. In practice, we believe the European Investment Bank will step in to fulfill this role. If Spain wants a bank bailout that doesn’t jeopardize its sovereign bonds, it must yield control over its banking system. It must accept that fact that its banking system may be too big, that institutions may be liquidated and management teams fired. It’s too early to write off Europe. In the short-term, expectations are so low that policy makers will have a hard time disappointing. In the meantime, central banks around the world appear to be hoping for the best, but planning for the worst. That may mean easy money, a weak U.S. dollar, with money flowing into currencies of countries whose central banks can afford to not join the fray. To us, it is no coincidence our analysis of recent market data suggests biases of major central banks towards easing, whereas central banks of smaller countries shift towards tightening monetary policy. Please sign up to our newsletter to be informed as we discuss global dynamics and their impact on currencies. Please also register for our upcoming Webinar on July 19, 2012.